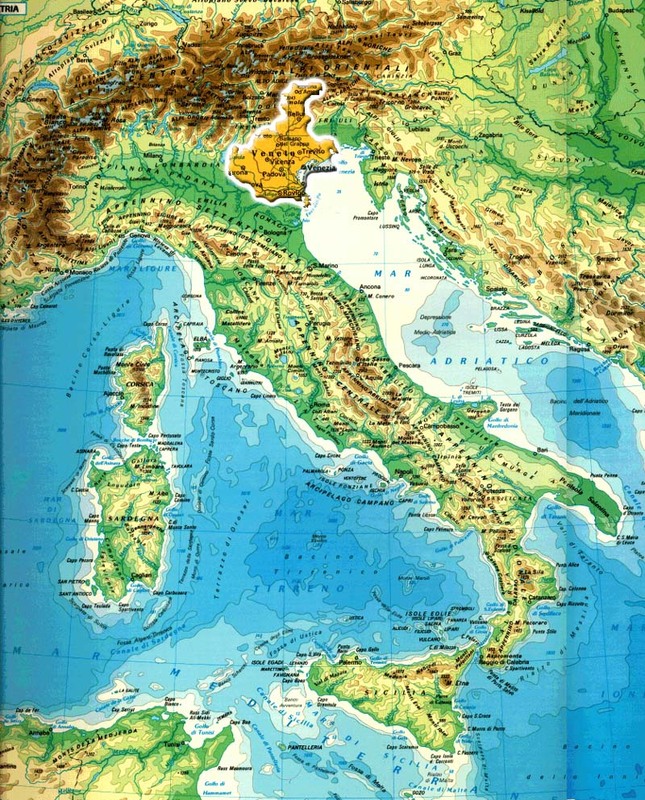 The Euganean Hills, of volcanic origin (most of them are "laccoliths" and cannot be considered real long-extict volcanoes), rise gently out of the sorrounding plain like backs of sleeping dinos. Next to the woods of age-old oaks, hazels, walnut-trees, delicate Mediterranean maquis, they present wide terraced slopes with fruit trees and grapevines. 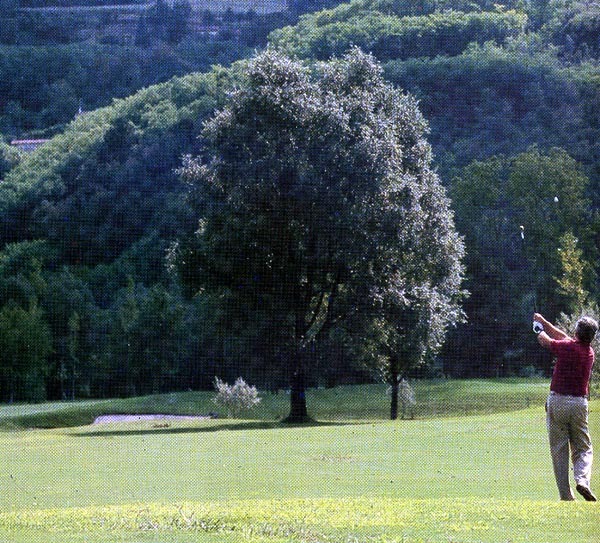 In 1989, The Regional Park of Euganean Hills was founded covering an area of around 19 thousand square hectares and 15 villages. The Park was formed to protecting all of it, as well, as to promote the traditional activities of the area. These activities must be compatible with the protection of its enviroment, history, culture and its oeno-gastronomic tradition. 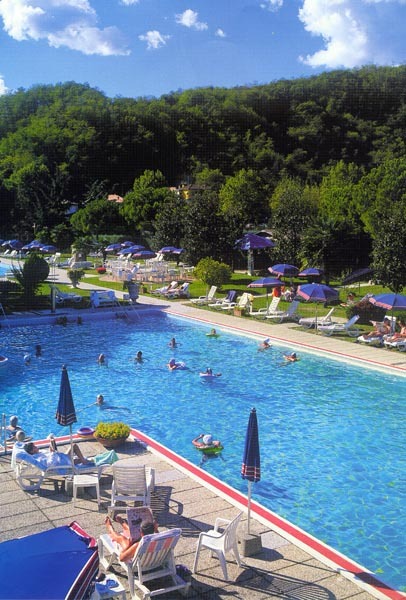 The Terme Euganee Spas are wellknown both in Italy and in Europe for their hyperthermal mineral waters containing sodium chloide, sodium bromide and sodium iodide .Water at a temperature of 87° C supplies all the heat needed by the 108 elegant hotels in the thermal basin. The springs make the Hollywood-like outdoor pools magical and charming even in the middle of winter and offer an all-year thermal tourist season. 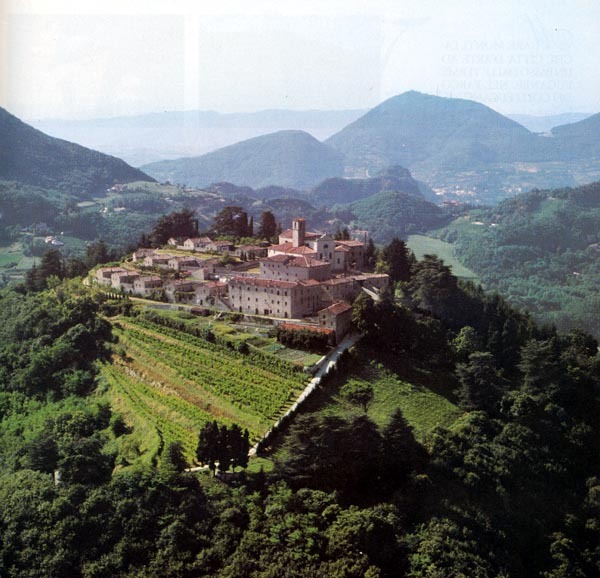 The Colli Euganei are an ideal place for artistic and natural itineraries. The trail "Atestino" starArquà Petrarca, the medieval hamlet that inspired Francesco Petrarca's final verses and makes a wide ring touching the peaks of Monte Orbieso (330 m asl), Monte Fasolo (289 m asl) and Monte Rusta (396 m asl), where botany lovers can admire rare species of orchids in the shade of majestic chestnut trees. The blooming of the almond trees in the Spring is also well worth seeing. Ghosts of ladies and lords and knights in armour are still said to wander through the rooms of Castle Cini in Monselice, once a proud fortress commanded by the Carraresi and now a medieval museum. The Castle is a part of the city's most important monumental complex composed of the Rocca and the 16th Century "Santuario delle Sette Chiese". Este is the city of Azzo II, the founding father of the Estensi Family who reigned here until 1239 before moving to Ferrara and ceding control to the Carraresi. The fascinating castle, of which only the trapezoidal wall structure and the "mastio" remain today, is the merit of this latter family. A few steps away, stands Palazzo Mocenigo, the 16th Century seat of the Atestino Archaeological Museum. The cultural vivacity of the city of Este in the following centuries, and between the 1500s and the 1700s in particular granted the city an atmosphere of refined nobility. 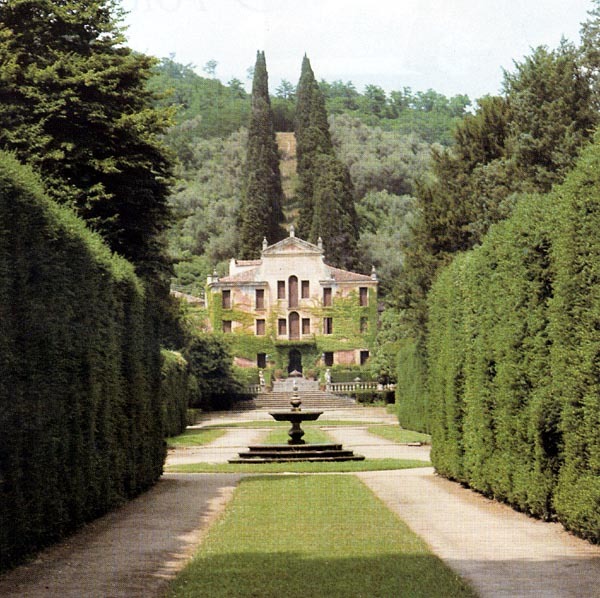 Among the numerous patrician residences dotted througout the area, the Princes' Palace designed by V. Scamozzi for the Contarini Family is worthy of note. It is here that Luigi Contarini received word of his appointment as Doge. You'll reach the Palace along the romantic Prince's trail from Villa Kunkler, which also provides a magnificent view of the Castle walls. Montagnana offers the visitor an extraordinary spectacle: the Carraresi walls - a ring over 2000 meters long and 17 meters high interrupted by 24 hexagonal towers and the insertion of the Rocca degli Alberi, the Church of San Francesco, and the Castle of Ezzelino da Romano. Once a year, noble ladies, lords and knights on horseback in medieval costume return to the ancient town as in a fable, the Palio horse race is run and the Rocca is set on fire to celebrate the banishment of Ezzelino. After hermitages and medieval fortresses, the 15th Century brought the Euganean Hills a season of refined beauty and artistic flowering that finds its most complete expression in the Veneto villas. Architects such as Andrea Palladio, Gian Maria Falconetto, and Andrea della Valle contributed to the design, sculpture, and ornamentation of the dwellings belonging to the most powerful Veneto families outside the city gates. The results are seen in the Villa Papafava in Frassanelle, Villa Barbarigo in Valsanzibio, Villa dei Vescovi (now also known as Villa Olcese) in Luvigliano, and many architectural jewels perfectly inserted in the gently rolling Euganean Hills. Play of light, contrasting facades, lawns, groves and gardens blend into the surrounding countryside to create natural settings animated by water nymphs, cherubs and ancient pagan divinities that complement the shrines to the Virgin Mary and Christ erected at country crossroads in a unique combination of the sacred with the profane. Workshops and ñbottegheî (artisan studios) like those of bygone days are still in operation today, where master craftsmen labour at precious works of art. These unique creations are worked with painstaking care according to traditional methods passed down through the generations. Period furniture, violins, copper articles, ceramics, dolls, stone sculptures, leatherwear and jewellery will all vie for your attention along this artistic itinerary from village to village accompanied by the memory of gracious ladies and powerful feudal lords.